Local SNP MSP Stewart Stevenson has called on the Government to be more supportive of ‘home-grown’ and ‘home-produced’ food during a debate in the Scottish Parliament. The MSP was supporting an SNP amendment in Parliament which supported a public procurement policy that ensures where possible that food is sourced locally. “Although supermarkets dominate the market, the biggest buyer of food is the Government through its various arms and agencies. The Government should be doing more to support our primary producers. With the availability of the new electoral register at the beginning of December, Stewart Stevenson MSP is stepping up preparation for his consultation with Banff and Macduff residents on proposed developments. “The detail of the work necessary to organise a fair and trustworthy referendum has been greater than I had anticipated. In fairness my colleague Alex Salmond MP warned me that I might have bitten off more than I could chew. But I am now in position to move ahead. “Obviously we would all have preferred to have moved sooner and with knowledge of Tesco's detailed proposals. But we should not wait any longer. 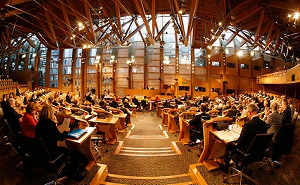 “Of course the result of the vote cannot bind the Council or Scottish Executive who will have to make the decisions. But it will be a significant input to their decision-making process. “The sensible dates would seem to be a Friday and Saturday towards the end of January. We need a suitable question to ask and I putting up my own suggestion so that people can respond with feedback. Banff & Buchan MSP Stewart Stevenson has welcomed a new initiative from Visit Scotland, which will make additional funds available to tourism businesses across Scotland annually. The Visit Scotland Challenge Fund is designed to help the promotion of tourism. “Tourism already contributes well over £4 billion per annum to the Scottish Economy. It is also an important part of the North-east economy. Tourist enterprises have been hit hard over the past few years due to foot and mouth and this summer’s poor weather. "It is crucial therefore that Visit Scotland, Scotland’s main tourist promotion body, makes further resources available to those involved in tourist industries. "I understand from Visit Scotland that groups of businesses will be encouraged to work together to access the fund to generate all year round tourism. The Fund will provide an excellent incentive for businesses to work together on a specific promotion. "Grants of £2,500 to £50,000 will be available for proposals from groups of businesses. They will also benefit from building on Visit Scotland’s marketing activity. “There will be an application round in February and June and funds can be used for marketing activities such as direct mail, exhibitions, online communications or market research. “Those looking to apply should contact their local tourism office in the first instance to discuss their project. These local offices can also assist with helping to develop the project and offer advice on completing the application form. Banff and Buchan MSP Stewart Stevenson has signed his colleague, Brian Adam’s Parliamentary Motion expressing concern about the impact of proposed cuts by the Department of Work and Pensions in local provision of benefits advice. “Should the proposed cuts go ahead, then it is unfortunate that the outcome will most likely be a likely reduction in benefits uptake by many vulnerable people which is a great shame. What I find deplorable is the unfair geographical spread of the cuts, leaving Grampian, Tayside and Fife without any local offices whatsoever. “As a result, there shall be a consequential increased workload that will fall on local authority and voluntary sector money advice services, when they already work to capacity and are in huge demand. Banff & Buchan SNP MSP Stewart Stevenson has welcomed the commencement of the National Fallen Stock Scheme this week. The Scheme has been introduced as a result of new regulations which ban the routine burial of fallen livestock on the farm. Local farmers have been keen to see the scheme introduced and have raised the matter previously with Mr Stevenson, asking him to keep pressurising the Government in an effort to get a start date. “It has been a rather tortuous journey but I am pleased that there is now a scheme in place, which also has a 30 per cent discount to farmers. Shadow Deputy Justice Minister Mr Stewart Stevenson MSP has today (Wednesday) said that the HM Inspectorate of Prisons report into conditions at Aberdeen Prison were further proof of the Executive’s lack of action to improve conditions in Scottish jails. “While some progress has been made at Aberdeen prison, this is more a result of the work of staff than action from the Scottish Executive. “The Executive has already been challenged over human rights issues because of the state of our prisons and this is yet another example of shoddy leadership. “One quarter of inmates are unable to provide a negative test for drugs which is worrying enough but the fact that the building itself is substandard is cause for greater concern. “Windows that are broken cannot be replaced due to a lack of funds and instead are filled with wooden blocks that are clearly not fit for purpose. This combined with severe overcrowding could cause the Executive further problems. Banff and Buchan MSP Stewart Stevenson has backed a Parliamentary motion noting the worrying rising number of people with diabetes in Scotland as evidenced in the recent report from Diabetes UK Scotland, Diabetes in Scotland and the UK 2004. “The recent report informs that that there are 148,000 people in Scotland diagnosed with diabetes, which is a rise of 28,000 since 1996. It is also worrying to learn that at least 65,000 people in Scotland are undiagnosed, as highlighted in the report, and that this number is growing year-on-year. In addition, it is concerning to discover that many are unaware of the risk of death from insulin deficiency. “Recognition must be given that diabetes is associated with chronic ill-health, disability and premature mortality and that long-term complications, including heart disease, strokes, blindness, kidney disease and amputations, make the greatest contribution to the costs of diabetes care. And many of these long-term effects could be avoided with earlier detection and more effective treatment. “More needs to be done to get the message across that diabetes is not a mild condition. Diabetes is in fact one of the most serious health issues facing Scotland and the rest of the UK today and if society keeps on ignoring its importance we could be facing a potential health time-bomb." Scotland's Farming and Public Health Ministers Ross Finnie and Andy Kerr are being urged to act on the advice of the Food Standards Agency and lift the ban on beef exports. The call by Highland MSP Fergus Ewing is being backed by Banff & Buchan MSP Stewart Stevenson, who was accompanied by Mr Ewing at a meeting with Ross Finnie last week. "The Food Standards Agency is independent of Government. It was set up to be the public watchdog on food and the guardian risks to public health. It has told Ministers 4 months ago that the Over Thirty Months (OTM) rule can be replaced in two stages with BSE testing of cattle older then 30 months. Yet the Government have failed to act on this advice, apparently because the English Chief Medical Officer disagrees with the FSA. "The problem is not in Brussels but in London: there is no barrier in the EU. Brussels recognise that the UK are at the same risk status as rest of the continent, but the UK is the only state in Europe with domestic and export restrictions on beef. Many farmers think that it is disgraceful that the UK Government is prepared to spend £400 million on a scheme which is unnecessary. “My constituent Mr Ruaridh Ormiston, of Ormiston Highlands, breeders of Highland Cattle has told me that even now with the ban in place there were foreign buyers from Denmark and Germany who attended the Highland cattle sales last month, and some of whom apparently bought up stock with the ban still in place, leaving the beasts in the care of Scottish breeders. “He has pointed out that the OTM scheme costs a ridiculous £1,200 per animal to the government as well as a substantial loss to the farmer over the beef price and subsequent replacement costs. “Surely we should let London run our policy when the independent watchdog, the FSA says that it is not necessary to continue with the ban? And of course, even when it is lifted, it will take a long time to re-establish trade links which were lost - and so the sooner the ban is lifted the sooner that hard work can begin. “The OTM scheme is one of the issues that is frequently mentioned to me by farmers and was raised with me again at the recent ‘Farmers’ Forum’ in Turriff which I organised. Banff & Buchan MSP Stewart Stevenson has welcomed the new Cross-Party Group on Food which was formed at a meeting in the Scottish Parliament last night. The SNP MSP has been a long-time supporter of initiatives to highlight local food and produce and to support local food producers. Last month, Mr Stevenson visited Downies of Whitehills with Euro-MP Ian Hudghton to highlight Scottish Food Fortnight. “The formation of this new Cross-Party Group is a welcome development and one which I wholeheartedly support. Among non-MSPs at our inaugural meeting, we had a wealth of knowledge and expertise from across various organisations charged with food promotion and encouraging healthy eating and I hope that local food producers will be able to come to future meetings and tell MSPs first-hand of their experiences in the marketplace. “I was particularly pleased that our first speaker was Ian Sandison of Aberdeenshire Council who is in charge of sourcing food for the council’s schools. The council certainly seem to have made good progress in supporting local producers and that is exactly the sort of attitude I wish to see in the public sector. “However, the one sour note of the event was when Green Party leader Eleanor Scott stated that schoolchildren should be encouraged not to drink the excellent water and water products which are produced locally by Sangs of Macduff and are now available to schoolchildren in Aberdeenshire Council’s schools. Banff & Buchan SNP MSP Stewart Stevenson has been given a commitment by Rural Affairs Minister Ross Finnie that he will look at including more genetic information on cattle passports as a means of reducing the amount of red tape farmers will encounter under the national beef envelope scheme. Presently, cattle passports issued by the British Cattle Movement Service (BCMS) contain details of the animal’s parents, but beef envelope regulations require confirmation of the animal’s genetic origin from the previous generation. Local farmers have complained to Mr Stevenson that the cattle passports do not contain the information needed for the beef envelope and will result in more paperwork for farmers. At a meeting with Ross Finnie in Edinburgh this week, the Minister gave an assurance to the SNP MSP that he would look into the situation with a view to getting this information included on the passport. “While we may disagree on the implementation of the national beef envelope, Ross Finnie took on board the point made to me on numerous occasions by local farmers that the cattle passports were inadequate for the amount of information required on genetics to comply with the beef envelope.